Ora tocca a noi is a project produced by the Association WW1 - dentro la Grande Guerra with the support of the Region of Veneto. 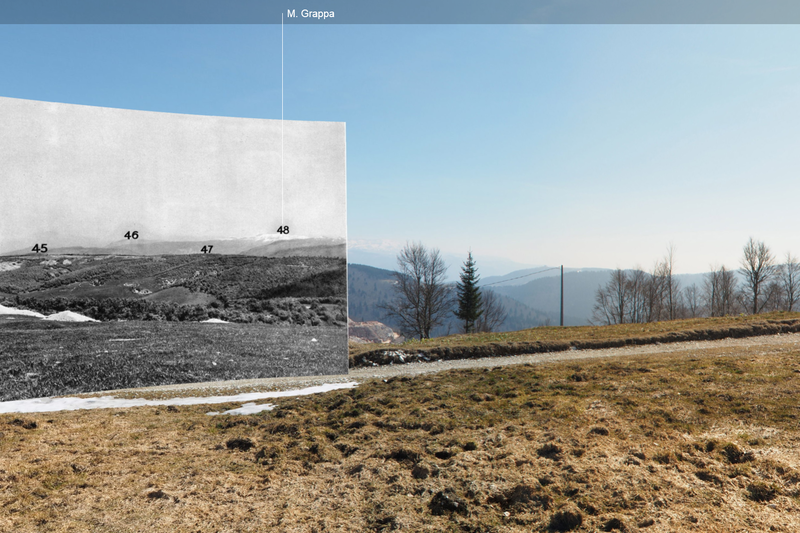 The project aims to present and commemorate the Great War with a contemporary approach and by using innovative languages. The possibility to consider History under a different glance is a way to arise awareness about the imprinting that conflict gave to current world and to figure out how today people can actively contribute in building a better present and future. 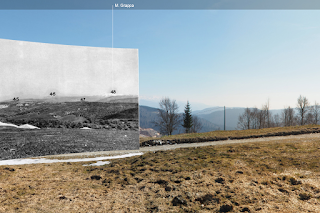 The project includes an emotional video which underlines how veterans contributed to change the world 100 years ago and a collection of interactive panoramas which match today landscapes with the places where soldiers and civilians lived in war time. These two media will contribute to open a debate about how past is strictly connected to our lives, to remember it was hundred of thousands young people - as we are, involved in it and to consider how places changed along the last Century. Two other elements help users to draw a critical thinking. 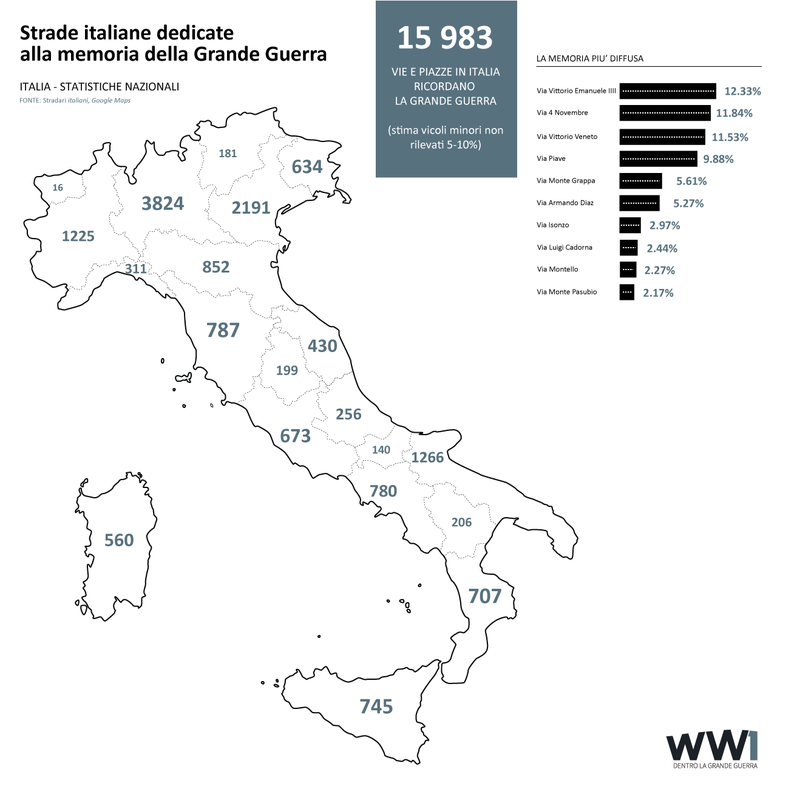 First of all, a map of Italy permits us to know almost 16,000 streets in Italy are devoted to the Great War. 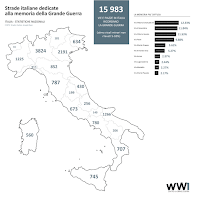 The unthinkable impact that events had on people and places as well as and the necessity to make Italians believing it was an useful effort and a concrete tribute to the Country in the years after the war, gave floor for memorial monuments’ building and streets’ naming. Names of “famous” people such as Gen. Luigi Cadorna or the King Vittorio Emanuele III, war places (mountains, rivers, cities, etc) or events’ date (the date in which Italy joined the war or signed peace agreements, etc.) became toponyms. The collection and the analysis of street names permit to figure out how a country is keeping memory of its past, how and why this process and emotion can be different in different regions and how often people do not realize their street is called “Monte Grappa” not because in Italy a mountain had that specific name but because of thousands of casualties the First World War counted in that area. A call is now opening to European Countries to map similarly their memory by a specific research on street names. Second, a growing collection of news related to current day wars is provided in the project. A deep extended financial crisis is going on and bloody wars are broadcasted in daily news from nearby Countries. Italy, European Countries, worldwide Countries in 2015, are all involved in conflicts. This is here and now, it is not just a matter related to our grandparents’ age. Beyond an idealistic need for peace, a shared and more conscious approach to economic, social, political matters is definitely needed today. To reach this goal, Ora tocca a noi proposes several educational activities. The possibility to interact with students and teachers, but also with young people and adults in general, allows to spread a new way of learning History and Culture while fostering new possibilities for social and economic growth. The project will be available on www.oratoccanoi.it and officially launched on July 3, 2015 at the Museo della Terza Armata in Padua - Italy. All people liking it are very welcome! WW1 – dentro la Grande Guerra (www.grandeguerra100.it) is an Association which considers the Great War as a first focal point to promote culture and sharing as the ground for a better awareness, social and economic growth. All projects are developed with the collaboration of high skilled researchers and professionals from Italian, European and extra-European Universities, Technologic Industries and Culture Field. Digital Distillery, Officine Panottiche + NuovostudioFactory and Hive Division are the founders of WW1 cross-media project.